The mood was not really joyful these days. It was the beginning of a new decade, the 1980ies, and in a small part of north-western Switzerland many people were concerned about the future of the watch industry, which employed many inhabitants of these green valleys. “Hi little brother, my boss M. Bally would like to see you. I showed him some of your engravings and oil paintings. He asked me, whether you would be interested in designing a watch and some parts”. Jacques Müller continues.”I don’t want to hear anything more about watchmaking. I’m finished with it!” Bernard replied. Bernhard, strongly tied to his brother, didn’t know much about Jacques’ work. Even less about the ‘Swatch’ project, which was kept a closely guarded secret. Hence, he couldn’t imagine the importance of that offer. Obviously Jacques knew, but he also knew his brother very well. A few days later, the phone rang again. “Listen, just try, it will help you”. A small job for 1000 Swiss Francs (about 1000$), thinks Bernhard, who finally accepts to contact the vice director of ETA SA, M. Bally. Marlyse was not enthusiastic about that job either, but finally she had emphasized:” If you have been rejected at ‘Fontainmelon’ (another watch factory) you have every chance to be accepted at ETA”. And that makes two Müller’s going to Granges. First encounter at the ETA site: “We are developing a new product and we would like you to be part of it”. But first they wanted to know of what Bernhard was capable of. They proposed the task to realize a watch casing, just the shape, probably for a design. It was just a style exercise. Back in ‘La Chatière’: “really, this time I’ll open my own business. Would you be willing of being a fifty-fifty associate?” Marlyse has her feet on the ground; this proposition scared her a little. Not serious enough this whole thing. Her reaction did not really satisfy Bernhard. He knows that he needs someone to keep this business going, someone who takes care about the finances and the interests of the business. Technically, of course, Bernhard is a professional. When you live together, you don’t need to verbalize everything to be understood. Marlyse sensed, that her hesitation could compromise the motivation for Bernhard to get started with his business. After some discussion, Bernhard succeeded to convince her partner in life to get his partner for business as well. Both decided to follow the tradition of having some Champagne to seal the deal. One detail was missing: The name of the new company! ‘Müller and Schmid’, but Marlyse replies that ‘Schmid and Müller’ would flow better and would sound better. Now the work could begin as the phone rang with Jacques on the other side:” Today its Wednesday, they expect you to be in Granges on Friday. Try to get here with something nice, not too fancy”. In the meantime the new designers had received a box with rough casings, maybe functional but not really aesthetic. The perplexity was visible in their faces, without a real lead the couple discussed: “what are we going to do in Granges, what do you think will happen there?” Of course they needed to come up with something, but what? Marlyse, a sewing teacher, very gifted concerning fashion, had never imagined to design watches. They discussed the matter for a long time…and then an idea: For getting some inspiration and some material Marlyse rushed to a wall paper merchant and was hoping to get some samples. The innovation: She wanted to show the designs in color and relief instead of just drawings. Friday 1st of October 1981 the two designers took the train through Yverdon and Bienne to Granges. Marlyse and Bernhard passed the reception hall of ETA with their designs under their arms. Just a little late Jacques Müller picked them up. Marlyse and Bernhard looked at each other. The men were walking around the table to see better. 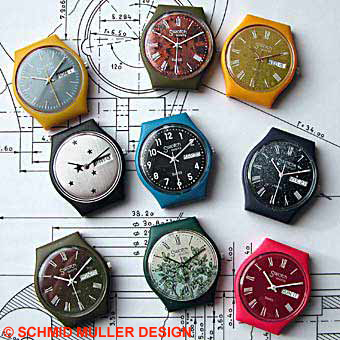 Like scarabs or butterflies the colored shapes on the cardboards brought the watch designs to life. What will get the funky Swatch in the future already was represented here: in the few colored and textured first designs, a play of contrasts and a choc of colors. 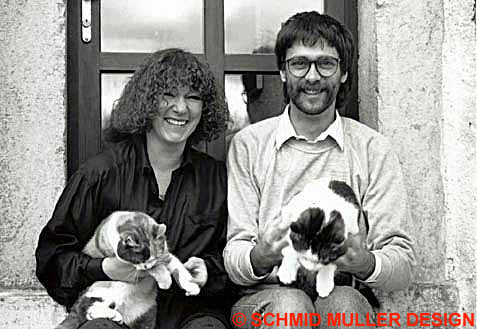 The 7th of October 1981 finally the decision from ETA to hire the couple Schmid-Müller reached ‘La Chatière’. Elmar Mock went by with examples of plastic casings, and it was then that Marlyse started to learn everything about plastic and their compatibility with other materials. That’s how their work as ‘prototype builders’ started: with plastic and modeling clay for children! It is impossible to list all the achievements which have been made by Marlyse Schmid and Bernhard Müller. If Elmar Mock and Jacques Müller represent the inventors of Swatch, Marlyse Schmid and Bernhard Müller can be described as the ones who gave Swatch its identity. They designed the final version of the casing: the shape and the two additional bridges for stabilizing the mount of the strap, which is one of the main characteristics of Swatch watches. They have designed almost all dials from 1981 prototypes up to 1986 market models, integrating in a very intelligent way the fluctuations in style and changes in color preferences through the 1980ies. Even the Swatch logo has been created by them, which is one of the easiest recognizable logos along with the one from Coca-Cola. But also the Swatch logo passed a transformation phase during 1982 before becoming the one which we all happen to know.